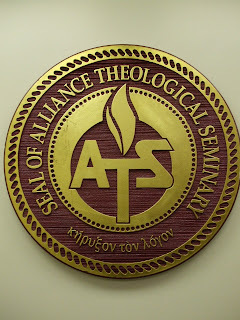 September 2, 2008 began an exciting chapter in my life, as I started attending seminary classes at Alliance Theological Seminary in Nyack, New York. Getting here was not easy and I am not referring to travel either, though it was a challenge to move all of my stuff from my 950 square foot apartment, to a 14’ x 22’ room and I have a roommate who lives next door to me and we share the kitchen and bathroom. He’s a nice guy too, from Ohio who is pursuing a Master of Arts in New Testament studies, which is a two year program compared to my three year study for a Masters in Divinity with a concentration in Bible & Theology. After a hectic and stressful move into my new apartment on campus, classes began the day after Labor Day. My first class was Initiation to Spiritual Formation (Tuesdays 3:00 p.m. – 5:15 p.m.) and there are about 80 students in this course that is structured to help students become more focused in their spiritual lives and in becoming more like Christ. I belong to a small group too in this class, six other men, our mentor Dan, a third year student, who has interned with a men’s ministry of a local church and myself. In this small group, we will pray for one another, discuss how our lives are while we are in school and address any struggles we are facing whether it has to do with our personal lives, work or academic related issues. This past Tuesday, we had a great time of prayer for one of the new members of our group who had been facing some family issues as well as struggling with what God has called him to do. There is quite a bit of reading to do for this class too, so I need to keep up with the syllabus and not fall behind at all. My next class is just 45-minutes later, from 6:00 p.m. – 9:00 p.m., with Dr. Bryan Widbin who teaches Hebrew Bible and the Eastern Mediterranean World. This is going to be challenging and fun! 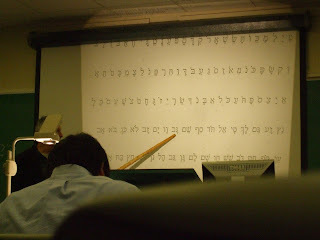 I am learning to read and write Hebrew in this class and will soon have my first test. So far, I have learned to recite the consonants of the Hebrew aleph bet and can write those letters fairly well and now I have to learn the vowels and how to read the consonants with the vowels. Hebrew is read from right to left while following the position of the vowels underneath or next to the consonants, so that the word is correctly formed. Again, this is not easy, but so interesting to learn. For three hours on a Tuesday night in this class, I am not bored at all! This class also has about 80 students in it too. There is a really great website for anyone who wants to learn a little more Hebrew, which is Hebrew for Christians. Wednesdays I do not have class so that leaves me some time to work nearby at The Home Depot. Thursday mornings from 9:00 a.m. – 12:00 p.m., I have Dr. Widbin again for another Old Testament class, Reading the Old Testament. This is another packed class with about 80 students here too. The day before I had called Cablevision to order cable service for my room, since I did not want miss what was on television while in seminary. Well, after realizing the amount of work I had ahead of me, especially with learning Hebrew and the reading requirement for the Reading the Old Testament class, I distinctly heard the Holy Spirit say to me, "Cancel the cable" and I had no arguement with that. The focus of this class is to be able to read the Old Testament in its historical context through proper exegesis and hermeneutics, which is discovering the original intent of the Old Testament authors and then properly interpreting the original intent to our lives today. Fee and Stuart (1981) state that a person cannot simply make a text of Scripture to say what pleases them, (though this does occur among many false teachers of the Bible,) where such personal interpretation is then credited to the Holy Spirit. There is a particular verse in the Bible that support this statement from Fee and Stuart, first is when Jesus said that the Holy Spirit would come and guide the disciples, as well as every believer into all truth (John 16:13) because He speaks not from his own authority but speaks only what He hears God speak. Fee and Stuart further adds that the Holy Spirit cannot be brought into a contradictory position regarding the infallible Word of God, whereby someone has misinterpreted the Scripture, because it was the Holy Spirit who inspired the original intent. This can also be found in Scripture from 2 Timothy 3:16 which says, “All Scripture is given by inspiration of God, and is profitable for doctrine, for reproof, for correction, for instruction in righteousness.” All Scripture is inspired, it is good for teaching others, for reproving the truth, for correcting those who are wrong, to be right again with God and Scripture instructs every believer how to live in the righteousness of Jesus Christ. The first day of this class, last Friday, we were asked to share what God has done in our lives this past summer that we would share with the class. I shared that after 20 years, since high school, I had finally graduated from college at Nyack and my successful completion of my undergraduate degree was a huge stepping stone to bring me to where I am today. This was just so heartwarming to them and to the class too, knowing that as parents they were bringing up their daughter in the discipline and instruction that comes from the Lord (Ephesians 6:4, NLT). The reading requirement for this class is heavy and I am very much looking forward to what I will learn in this class. This course also requires that I write a biography report from a list of books about missionaries. I have to also right a one page report on the main textbook that will be used for this course, The Next Christendom, which his due November 17th. I will also be required to pray for a particular country or people group for 30 days and to journal and a 15-20 page paper at the end of the semester regarding a case study of a mission-minded church. Times Square Church, where I attend weekly, is a mission-minded church and look forward to learning what the mission, vision, values and strategies are they are implementing for the case study I have to write. I have been told that there will be anywhere from 80 – 100 students in this class. In between all of that I work part-time at The Home Depot in West Nyack, which is located at the Palisades Mall and that is just another testimony of God's provision for me coming to ATS. I have been able to witness to a few people I work with and quite a few of them are asking many spiritual questions too since they know I am attending seminary and these questions were initiated by my co-workers first, which then gives me the opportunity to share my faith more openly with them. Seminary is great although I greatly underestimated how demanding the course load would be as a graduate student, but I am very happy to be here. I cannot thank God enough for all that He has done to bring me here, giving me the opportunity to learn more and to be able to apply that to my life and in ministry to others. Being here at ATS is truly an answer to prayer, where God has given me the desire of my heart and I cannot thank Him or praise Him enough that I am here. So, God worked out my finances regarding financial aid, which covered my tuition and housing completely, He opened the door for me to work at The Home Depot with a flexible schedule too and I work, live and go to school all within a two mile radius. Only God could have done all of that and I am sure it was planned out even before I was laid off last November. Fee, G. & Stuart, D. (1981). How to read the bible for all its worth. (3rd ed.). Grand Rapids. Zondervan. WOW - good for you. It sounds like you will be extremely busy. God is good. Enjoy! This week I have really opened my eyes to trusting in God during what I thought were "bad times," which turned out only to be changes that were to my benefit. When I think about what you went through a year ago and where you are today only confirms that to me. I know a couple of people who are out of work. One in particular who does not have God. He is a wandering soul - lost. Closed to the word of God. That could have happened to you. You chose to trust God and turned that situation into opportunity. Because you trusted God He will now trust you with this very important mission. It is not going to be easy. It is those closest to God that get put to the test. I know you are up to that challenge. I see a light in you. This is just the beginning. God has so much in store for you and I am so excited that you are allowing us to take this journey with you. Thank you for sharing your experiences with us. I may not be able to help you with your homework, LOL, but my cheerleading skills are still in tact and I am going to cheer for you all the way through! I read your week in review and very glad you have found the road less traveled to be your path. That is far from the days of Tiajuana, Mexico. I know I very rarely write. I don't even e-mail my own family, but don't think you are not in my mind and heart as your progress through this chapter of your life. I speak of you often to my fellow co-workers. I don't have the passion for religion as you do, but I do believe. Maybe someday. Congratulations on a successful next step in your life of GOD. I am so excited for you and was really looking forward to hearing about your first week. It still blows my mind that I am reading this incredible blog from someone once referred to (sometimes still referred to) as "the poolboy". I'm so grateful to God that you and Lori ran into each other, therefore, reuniting us - and to find out you are a Christian too - that was incredible! You are a great inspiration to believers and I'm sure non-believers as well. Wow! Kurt. Sounds like a lot, but, you can do it with God's strength. How wonderful to be living your dream! I will keep you in prayer. Praise God for His provision. Enjoy and be blessed at Seminary Kurt. Continue to stay close to the flame and listen to the Holy Spirit. I will continue to lift you up in prayer each day my friend. So very happy for you that you have found your calling. So few of us listen as closely as you do. I wish you the absolute best + hope that your studies prove challenging yet immensely rewarding. I must admit I'm very excited for you and I thought your blog entry was great. I look forward to more as you find the time to write. I did go to the Hebrew for Christians website. Hebrew was one of the language options for my children - we home school - so I forwarded the site to my oldest daughter as a primer. After Latin and Greek work last year, we have decided to work on developing language skills with non-western characters and Chinese or Hebrew became the top contenders. Chinese is in consideration for its missionary value and Hebrew for study (and maybe a trip to Israel ?). I have been to Israel and enjoyed it very much. Someday perhaps a family vacation to the region may be possible. So I just wanted to send encouragement and prayers your way, and let you know that as a brother in Christ, even though we know each other very little, I am likewise encouraged in my own walk by witnessing your commitment. Keep up the good work and keep me up to date on your progress!